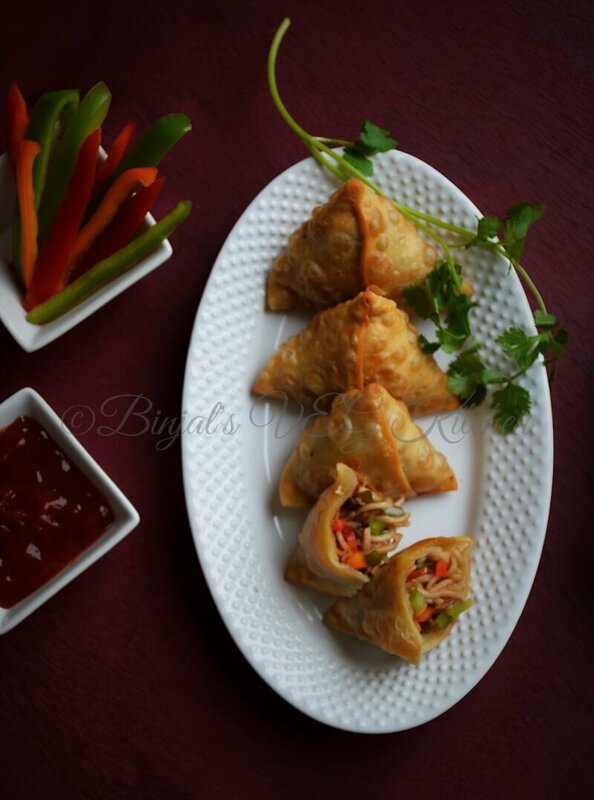 Chinese Noodles Samosa is a combination of Indian’s favorite snack and Chinese noodles into one. Chinese Noodles Samosa is very tasty and delicious. Indian Chinese cuisine is the adaptation of Chinese seasonings and cooking, this makes Indian Chinese food similar in taste to many ethnic dishes, Chinese Noodles samosa is one of them innovative dish. This triangular shape dish, outer cover is Indian and inside with Chinese filling. I am sure kids love this and when they open this samosa, sure their cute smile come on their face because kids love noodles. So try this dish with your family and friends and enjoy! 1. Combine Maida, Salt, Carom Seeds, Ghee/Oil, and mix well in a bowl. 2. 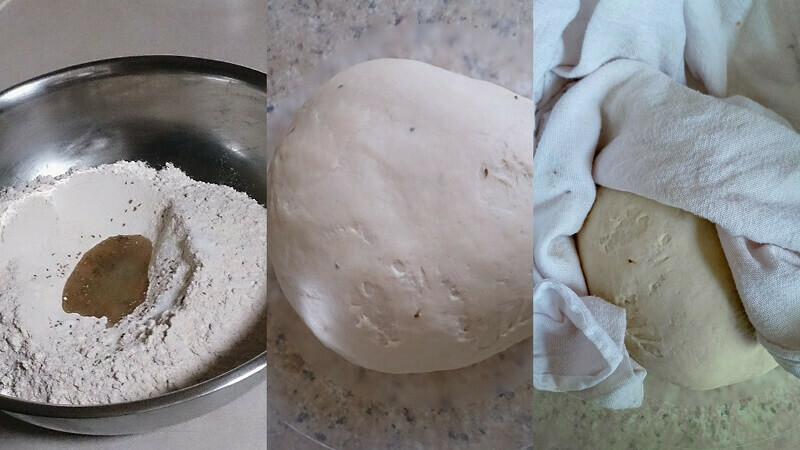 Add a required water, knead well and make a stiff-smooth dough. 3. Cover the dough and Keep aside for 10-15 minutes. 1. 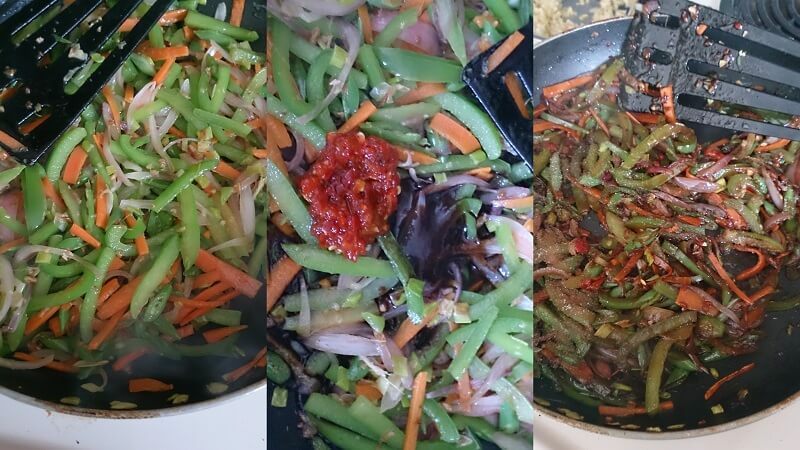 Heat oil in a pan, add Ginger-Garlic paste and sauté for few minutes. 2. Add Capsicum, Carrot, French Beans, Onion and Spring Onions and sauté for 5 minute on medium flame. 3. Add MSG, Soya Sauce, Red Chilli sauce, Vinegar, Black Pepper powder, Salt, and mix well. 4. Now add Noodles, mix it well and stir it for a minute. 5. Remove from the flame and keep aside, let it cool down. 1. Take the dough, knead it again and divide into small portion balls. 2. 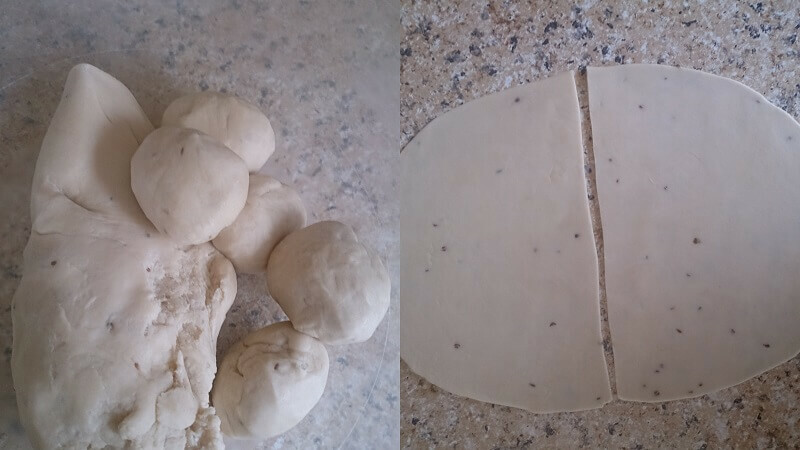 Roll out the ball into a thin oval shape chapati, and then cut into half. 3. Take one half and apply little water on the straight edge. 4. Fold the edge to make a cone such that watered edges are overlapped and sealed. 5. 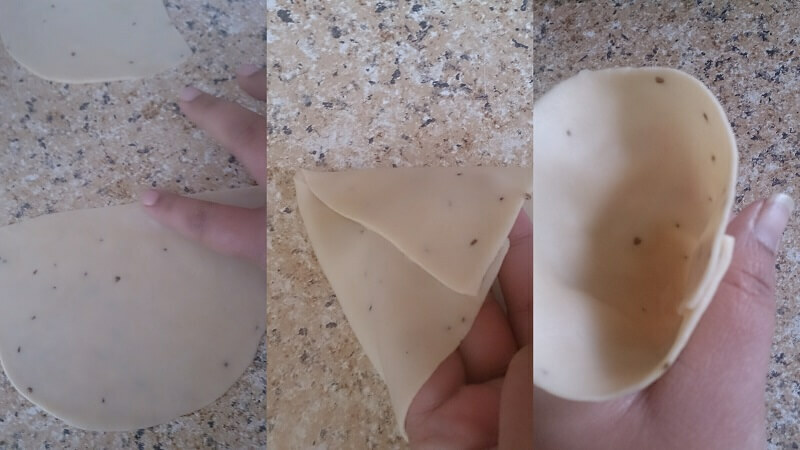 Put the stuffing into it and again apply water inside the edges and seal it to make a Samosa. 6. Repeat the same Process to make more Samosas. 7. Heat the oil and deep fry Samosas on medium flame till turn golden brown from all the sides. 8. Remove on absorbent paper towel. 9. 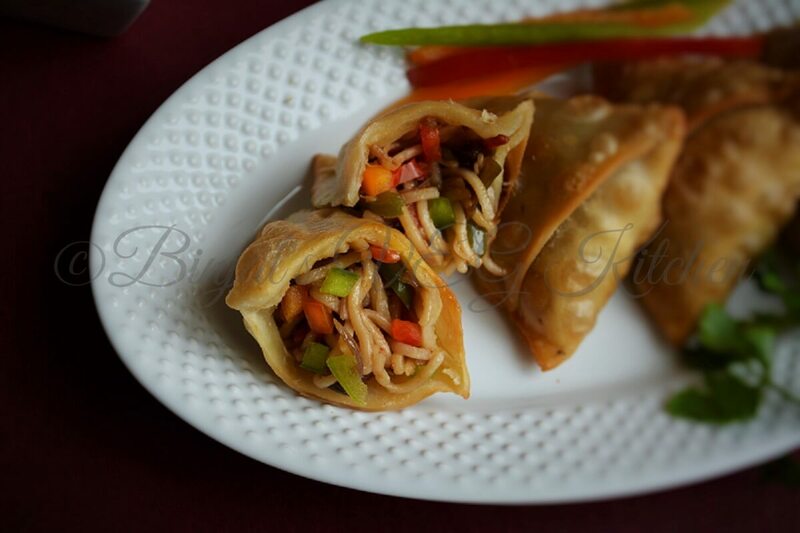 Chinese Noodles Samosa is ready, serve with tomato sauce or chutney. • Don’t use the flour for dusting when you roll the ball, else it will make Samosa oilier. • You can use Cabbage, Green Peas in a filling. 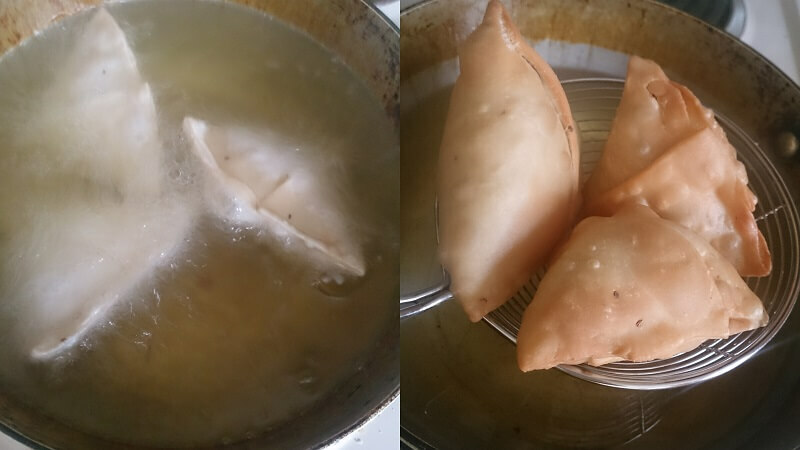 • Always fry Samosa on medium flame, it will help to make Samosa cover crispier. 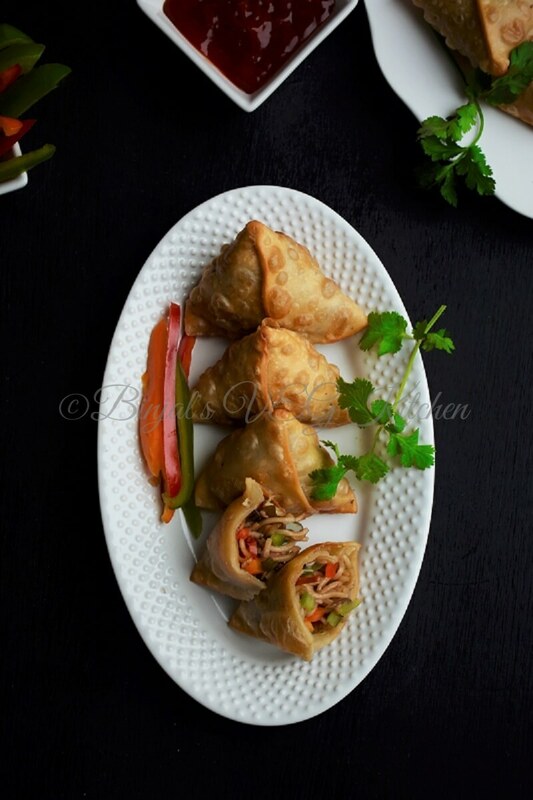 Chinese Noodles Samosa is a combination of Indian’s favorite snack and Chinese noodles into one. Chinese Noodles Samosa is very tasty and delicious. 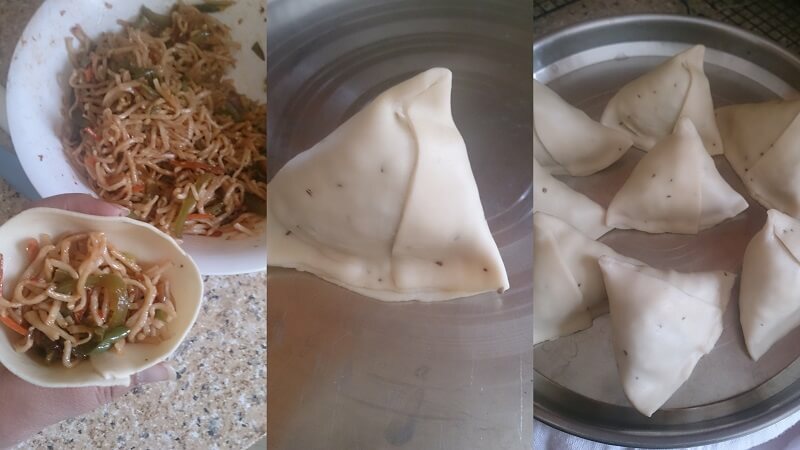 Indian Chinese cuisine is the adaptation of Chinese seasonings and cooking, this makes Indian Chinese food similar in taste to many ethnic dishes, Chinese Noodles samosa is one of them innovative dish. Combine Maida, Salt, Carom Seeds, Ghee/Oil, and mix well in a bowl. Add a required water, knead well and make a stiff-smooth dough. 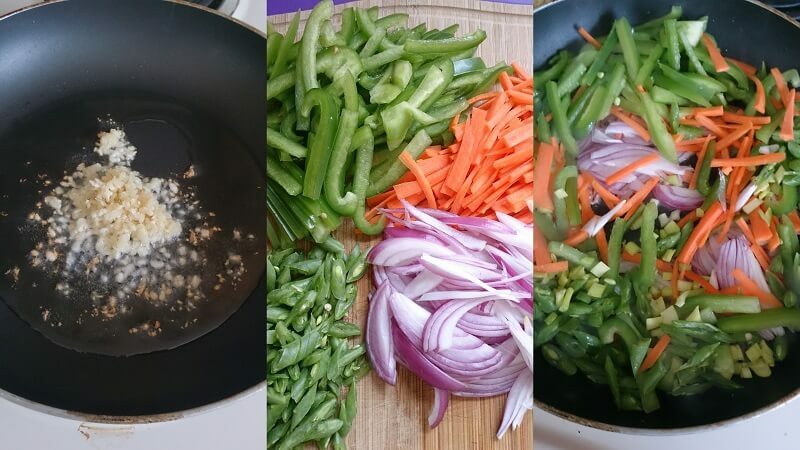 Heat oil in a pan, add Ginger-Garlic paste and sauté for few minutes. Add Capsicum, Carrot, French Beans, Onion and Spring Onions and sauté for 5 minute on medium flame. Add MSG, Soya Sauce, Red Chilli sauce, Vinegar, Black Pepper powder, Salt, and mix well. 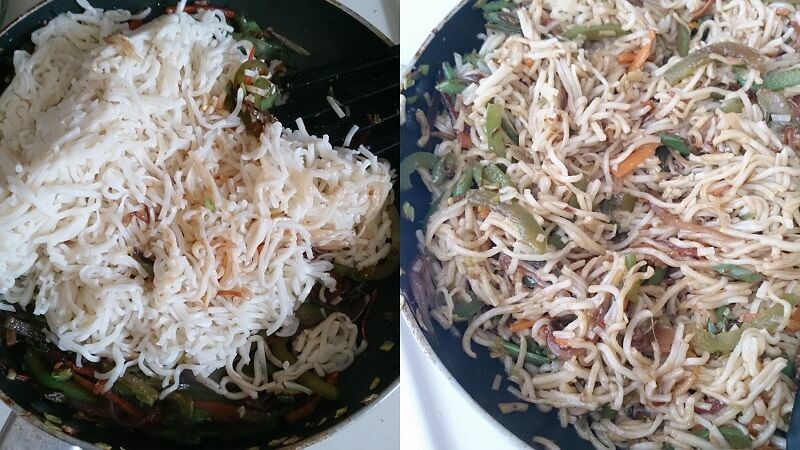 Now add Noodles, mix it well and stir it for a minute. Remove from the flame and keep aside, let it cool down. Take the dough, knead it again and divide into small portion balls. Roll out the ball into a thin oval shape chapati, and then cut into half. Take one half and apply little water on the straight edge. Fold the edge to make a cone such that watered edges are overlapped and sealed. Put the stuffing into it and again apply water inside the edges and seal it to make a Samosa. Repeat the same Process to make more Samosas. Heat the oil and deep fry Samosas on medium flame till turn golden brown from all the sides. Remove on absorbent paper towel. 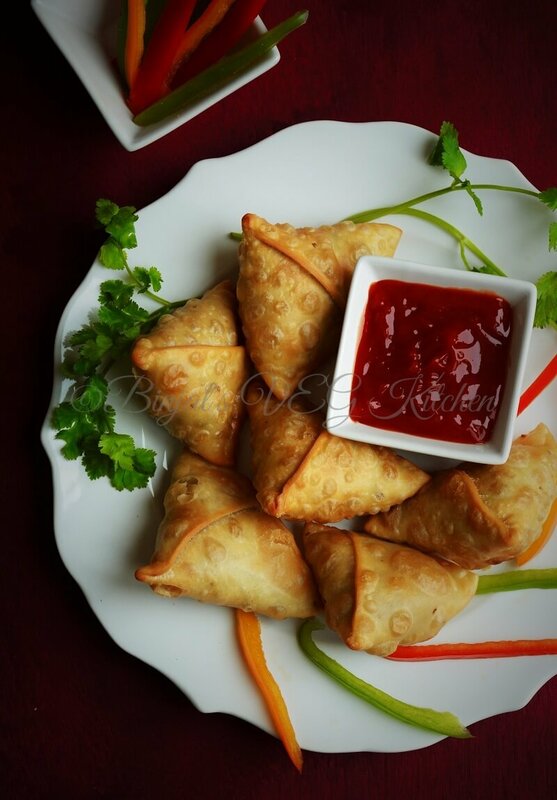 Chinese Noodles Samosa is ready, serve with tomato sauce or chutney. this looks amazing and your photos are so beautiful!